Yesterday I walked through the Treasury of the Cathedral of Santa Maria in Girona. It's a building that I know well and love dearly. In its treasury are some rare and wonderful things, but one of the most impressive is the Tapestry of Creation. It is a thing of great beauty; a true survivor that amazes not only by its antiquity, but by its size and complicated iconography. 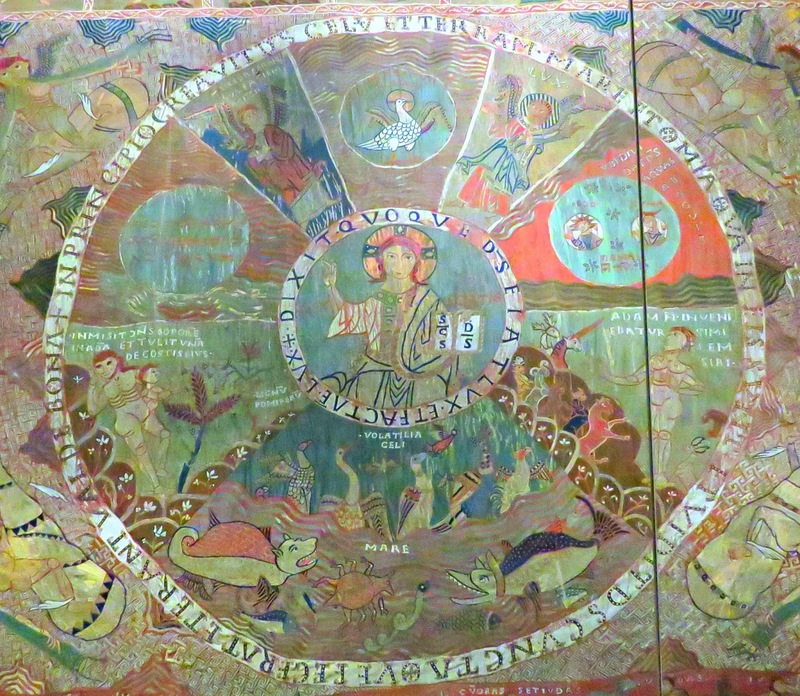 It combines the story of Creation with the cosmography of the calendar and the history of the Legend of the True Cross. It's also a thing of mystery. They think that it was created for use in the Cathedral, and they believe that it was created somewhere within the city of Girona , but they don't know what it was used for, who made it, or where exactly it was woven and embroidered. 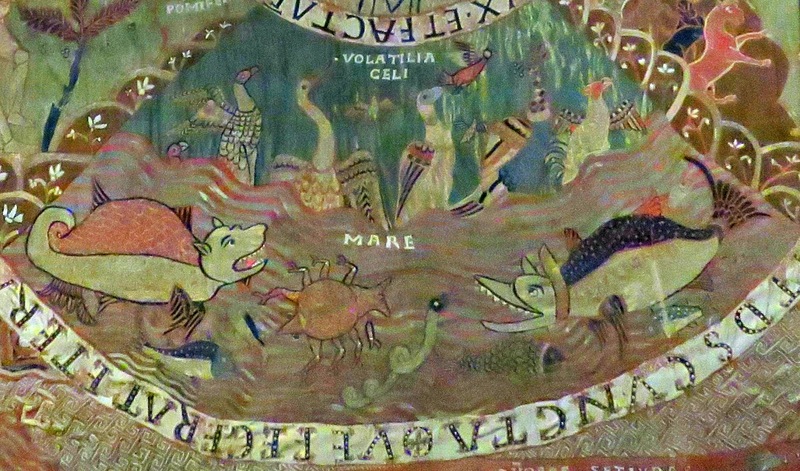 They reckon that the Tapestry of Creation was made in the second half of the 11th century, which, to put it in its historical context, would make it - give or take a decade or two - a direct contemporary of the famous Bayeaux Tapestry. Can you imagine the scene? The nuns bent over their work, embroidering this amazing textile here in Girona, whilst the wars for the Reconquest of Spain from the Moors raged along the Iberian Peninsula. England had just been conquered by the Normans. Whilst these ladies threaded their needles the ink was drying on the Domesday book, lances were being sharpened for the First Crusade and everyone knew for a fact that the earth was flat. It was conceived and created in a world far removed from our own; a world in which they thought about things in a different way. The scene unfolds from a central Wheel of Creation, with Christ, the Cosmocrator, sitting at the very centre. 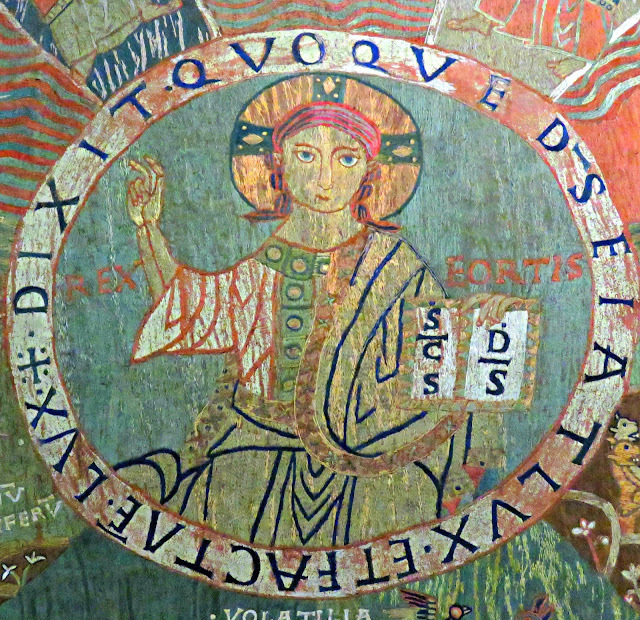 This Christ is a young, fresh-faced Emmanuel, who holds a book in one hand with the words Rex Fortis, strong king, on either side of his head. From this central image emanate two concentric circles that make up the Wheel. These are divided into sections that relate the days of the Creation and the Fall of Man. The outer circle introduces the words of Genesis Chapter 1,Verse 1: In the beginning, God created the Heavens and the Earth, the sea and everything in it, and God saw everything he had made and that it was good. The inner border contains the words of Genesis Chapter 1, Verse 3: And God said, let there be light. And there was light. Riding along the outer rim of the wheel are depictions of the four winds. Along the outer edge of the square that frames the Wheel are depictions of the days of the week, the seasons and the months of the year. Being an animal-lover I particularly liked the lower section, which shows the scene on the Fifth Day of Creation, when God created the animals and the birds. The designer clearly had a lot of fun imagining the weird and wonderful beasts that might live in the depths of the oceans. The border of the square that frames the Wheel of Creation is dedicated to Time, with representations of the year, the seasons, the months and the days of the week. 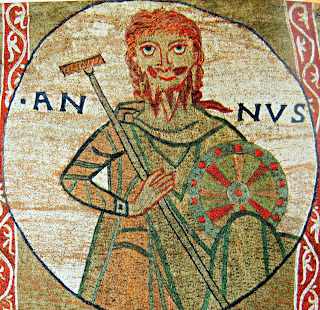 The figure below is the personification of the Year, his circular shield resonates with the Wheel of Creation, and the popular appreciation of perpetual time as a circular cycle that self-repeats. The Year is flanked by the seasons, Summer and Autumn, Winter and Spring to his left and right respectively. Around the other borders of this square are the days of the week and the months of the year. The months are represented by the theme or activity which would have dominated rural life at that specific point in the great cycle of the year. The square below, for example, represents the month of March, when all of nature is waking up after the long sleep of winter. 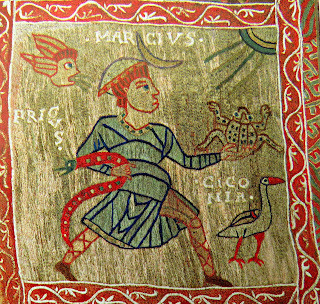 A frog and a serpent contemplate the arrival of a stork, whilst the March wind blows from the top left hand corner. 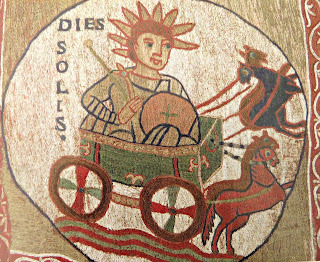 The square below depicts Sunday, the day of the Sun, with the chariot of the sun being drawn across the sky. And at the bottom of the square of the year around the Wheel of Creation section is a third part of the composition, which retells the Legend of the True Cross. Much of this section is sadly missing. This is believed to tell the story of Emperor Constantine's mother, Saint Helena, who, according to legend, travelled to Jerusalem to find the Cross of the Passion, but it takes a certain amount of imagination to envisage the action unfolding from the remains of this part of the tapestry. 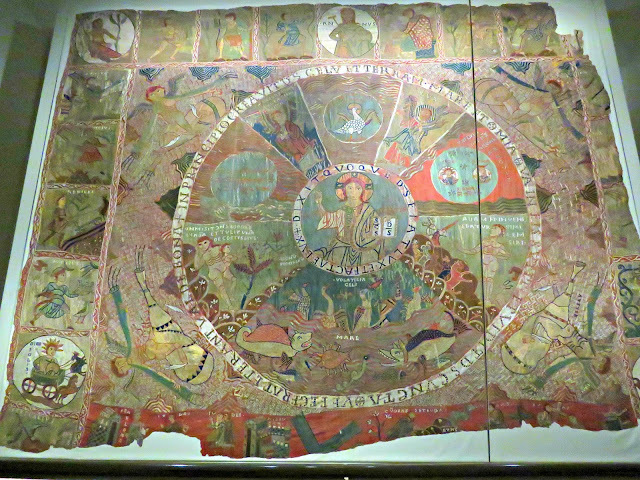 Today, what's left of the tapestry measures 358 cm x 450 cm, or 141" x 177" if you prefer imperial. Looking at the composition of the panels from which the tapestry has been composed they reckon that it originally would have measured an impressive 480 cm x 480 cm, or 189" x 189". 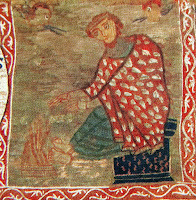 It was woven with wool, and then embroidered with wool in the fashion of the Coptic carpets from the East, which leads many to believe that it was really intended to be a carpet rather than a wall hanging. There are no stress marks produced by sagging, as would inevitably have appeared if it had been hung. There are no loops or scars left where hanging loops might once have been attached. 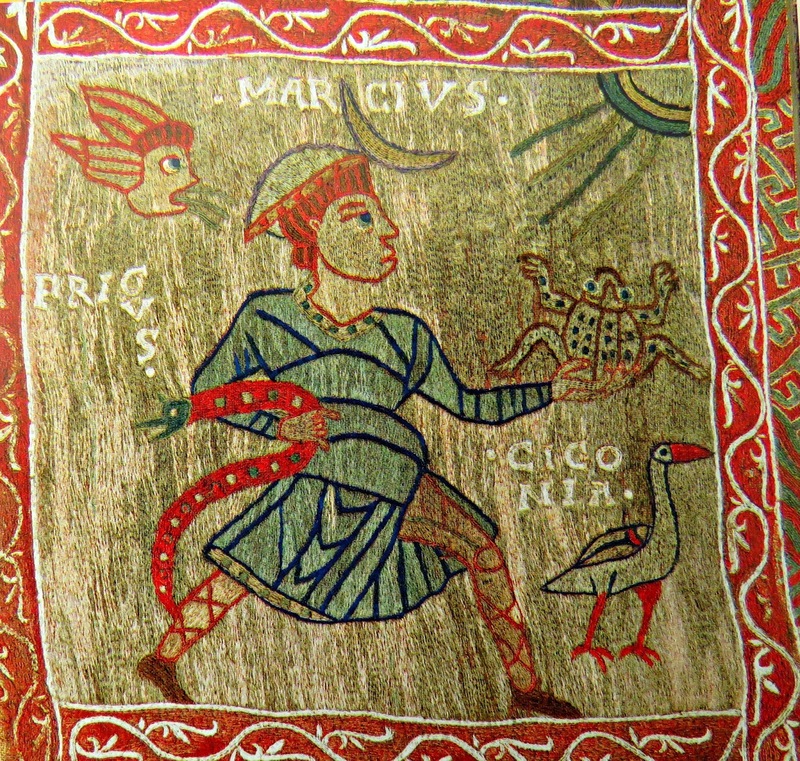 The famous Bayeaux Tapestry (believed to have been created between 1066 and 1082 in the South of England), like most tapestries conceived as wall hangings, is developed in a horizontal narrative, whereas the Creation tapestry has a centripedal structure that unwinds from the image of Christ at the centre. The Bayeux tapestry was woven from linen thread and embroidered in crewel work with woollen thread, whereas the Creation tapestry was both woven and embroidered with wool, creating a more robust fabric that would have better withstood the wear and tear of having been walked upon. 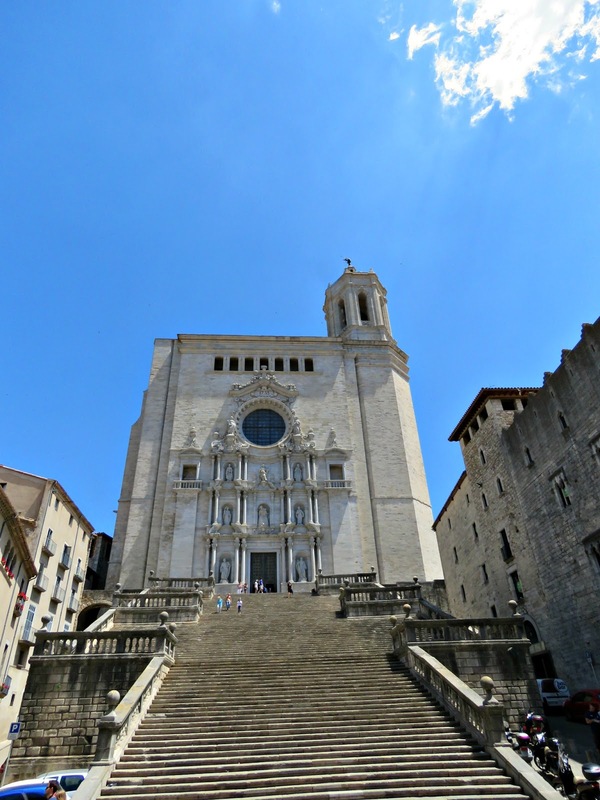 The current thinking is that it was possibly made to celebrate the Papal Council that took place in Girona in 1097, and was presided over by the Papal Legate, the Archbishop of Toledo, Bernard de Sedirac. The purpose of this Council had been to resolve certain conflicts within the Catalan Church, to encourage the restoration of the metropolitan See of Tarragona from the Moors and to affirm the legitimacy of the young Count of Barcelona and Girona, Ramon Berenguer III, under the protection of the Holy See. At that time, the young Count was only 15 years old. His father, Ramon Berenguer II had been murdered. Everyone believed that his father's twin brother, Berenguer Ramon, had been the assassin. Legend speaks of how Ramon Berenguer II was killed whilst out hunting. His faithful falcon remained with his master's body, and alerted his followers to where it lay hidden. The dead man's body, accompanied by the falcon, was brought back for a state funeral here in Girona Cathedral. And when the murderer attended, wearing his brother's crown the falcon shrieked, attacking the usurper and tearing the crown from his head. As the body of his master was lowered into its tomb, the falcon died of grief. For a time the wicked uncle acted as co-ruler with his nephew until 1097 when the young boy came of age. But suspicion had always surrounded Berenguer Ramon's involvement in his brother's demise. He was popularly known as the Fratricide, and it is believed that he underwent a trial by combat, which he lost. Finally he set off for Jerusalem, possibly as a penance for his sins or as part of the First Crusade. In any event he died in exile shortly thereafter leaving the way clear for his young nephew. After this tumultuous chapter in the history of the principality the Papal Legate sought to bring order and stability back to the ruling family so that they could continue to support the church and the Catholic Reconquest. The Tapestry of Creation may well have been conceived as part of the celebration surrounding the opening of a new chapter in the civic life of the province and the great dynasty who ruled it. Whatever the way of it, most agree that the most likely place for the tapestry to have been created is the Covent of St. Daniel just beyond the city walls. Here the nuns still carry on a workshop that specialises in the embroidery of liturgical garments. The Convent of St. Daniel was founded in the early 11th century, and its nuns, many of whom were drawn from the ranks of the aristocracy, were famous for their needle skills. 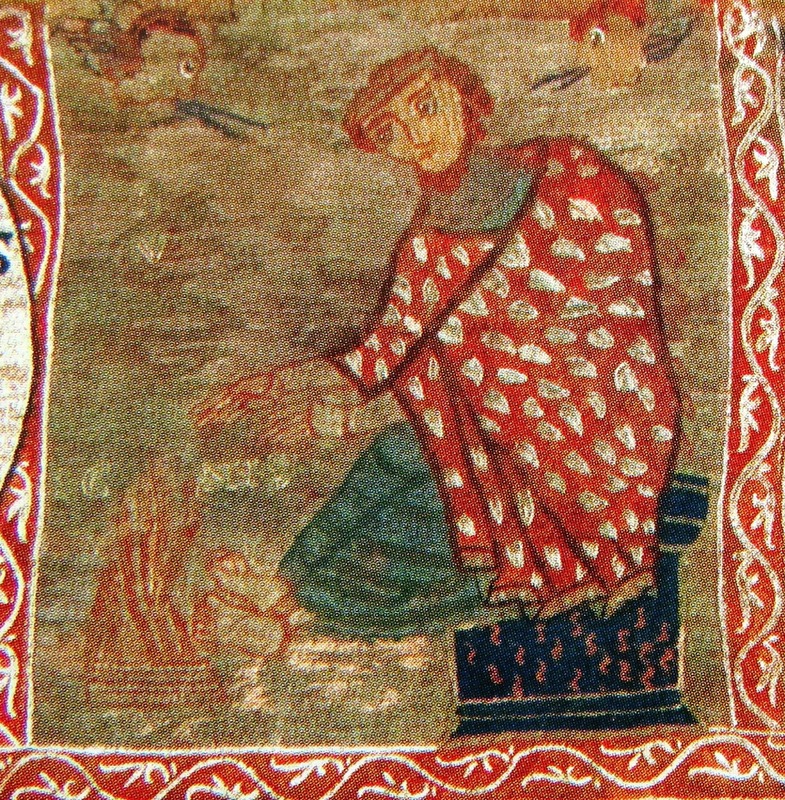 Young Ramon Berenguer's mother, Mafalda of Apulia, a Norman princess of great personal wealth, was a benefactress of the Convent of St. Daniel. Indeed she may well have commissioned the tapestry. website is here: Girona Cathedral. Go take a look on a hot day when the cool of the interior and the special magic of the textile will give you a welcome break from the hectic world of today. How absolutely breathtaking, Bonny! :) What a marvelous needlework, such an awesome work of art from the 11th century. Wow! :) How I hope to see it one day. That is quite a tapestry and so rich in history.